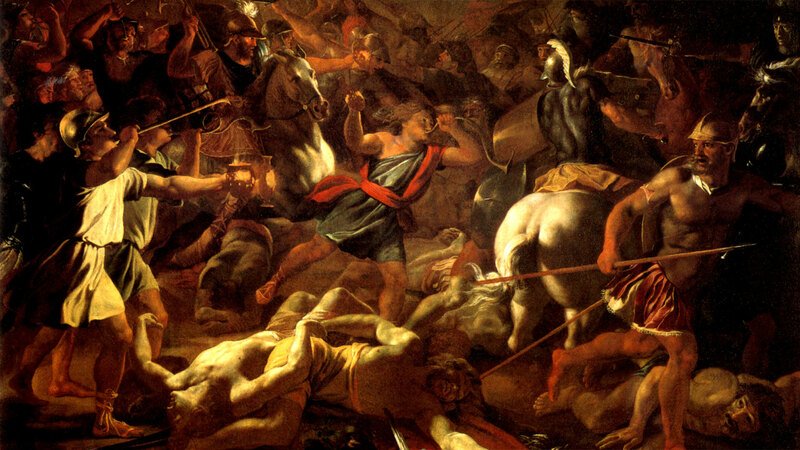 Image, top: Battle of Gideon Against the Midianites, oil on canvas by Nicolas Poussin (1625–26). Before the ancient nation of Israel had a monarchy, it was ruled by a series of judges. They were charged with the unenviable task of governing a people whose penchant for going after foreign gods led repeatedly to wars and subsequent pleas for deliverance, as graphically outlined in the book of Judges. Like the book of Joshua, its sequel, Judges, has come under attack from some scholars in recent years as historically unreliable. Yet also like Joshua, several pieces of internal evidence lend credence to its place as a valuable document in the history of the ancient Middle East. It affirms ancient Israel’s interaction with verifiable indigenous neighboring peoples and cultures over a period of nearly three and a half centuries. What happens in Judges is a precursor to the people’s demand for and the arrival of a monarchial system in Israel in the time of the prophet Samuel. Further, its record of the Israelites’ seesawing compromise with God’s way, and the chaos that comes on the nation when it departs from the godly moral order, is a key to understanding the Bible’s overall message of reconciliation between God and man. Seen from the perspective of its anonymous compiler, probably working in the early days of David’s rule over Judah, the book is a strong reminder of the need for and appreciation of faithful leadership and faithful people. Moses’ assistant and successor, Joshua, led the children of Israel into possession of the Promised Land. With God’s help they were able to establish themselves by conquest, their 12 tribes dividing territory between them on the east and west banks of the Jordan. As long as Joshua and the generation that survived him were alive, the people served God. Joshua died at 110 years of age (Judges 2:8), and the elders who served with him likely lived another few decades. But then “another generation arose after them who did not know the Lord nor the work which He had done for Israel” (verse 10). This statement expresses the tragic history of the majority of the people of Israel for the next several generations—the period known as that of the judges—between Joshua and the monarchies of Saul and David. Judges is based on historical records compiled at the end of a circa-350-year period. There are several internal clues to the book’s compilation date. Several references in the book address things that had been a certain way in times past, but no longer were at the time of writing (Judges 1:11, 23; 3:1–2; 19:10; 20:27–28). Six additional references to situations that were extant “to this day” likewise show that the compilation took place considerably later than the matters at hand. The last few chapters contain the phrase “In those days there was no king in Israel” (Judges 17:6; 18:1; 19:1; 21:25). This tells us that, by contrast, the book was compiled when Israel did have a king—thus sometime after the first king, Saul, took the throne (ca. 1050 BCE). Further establishing this as the earliest possible date of writing is the fact that Samson, the last judge named in the book, died ca. 1051 BCE. Gezer was still in Canaanite hands (Judges 1:29). Since Solomon was the Israelite who acquired Gezer (1 Kings 9:16), the book was written before ca. 970 BCE, when Solomon ascended the throne. Narrowing it down further, Jerusalem was in Jebusite hands at the time of writing (Judges 1:21). This was true until David conquered the city (2 Samuel 5:6–10; 1 Chronicles 11:4–9) ca. 1000 BCE. With all of this in mind, the most logical date for the compilation of the book is shortly before 1000 BCE, in the early days of King David. The term judges is a translation of the Hebrew shophtim, from the verb shaphat, meaning “to judge, govern or lead.” The judging that takes place in the book relates both to delivering from external threats and to governing internally. It was intended to provide military, civil and religious leadership against deteriorating social conditions. As a historical account, Judges reveals a pattern: obedience to Yahweh, followed by worship of foreign gods, which in turn leads to Yahweh’s punishment at the hands of other peoples, Israel’s beseeching Him for deliverance, God’s provision of a deliverer/leader/judge, and their descent once more into faithlessness and disobedience (verses 11–19). Before the ancient nation of Israel had a monarchy, it was ruled by a series of judges. Here’s a complete list, along with approximate dates for each. Not all of the judges demonstrate the kind of faithful commitment we might expect, however. Othniel, Ehud and Shamgar—the first three leaders among those listed—obey God and deliver the people. But Deborah, the prophetess and next judge, has to accompany her reluctant military leader, Barak, into battle to bring about God’s deliverance. Male leadership is at this point sadly wanting. The succeeding leader, Gideon, tests Yahweh several times, engages in a personal act of vengeance and sets up an object that people start to worship. Gideon’s son Abimelech is a self-appointed judge who kills his brothers. In his time, the people go back to worshiping local Canaanite gods. Of the remaining seven judges, only two, Jephthah and Samson, deliver the people from oppression, yet they also have serious personal failings. This, then, is a very mixed pattern of behavior, justifying the closing words of the book: “In those days there was no king in Israel; everyone did what was right in his own eyes” (Judges 21:25). It also explains that having disobeyed God in not dispossessing the remaining local peoples (see chapter 1), the Israelites would be disadvantaged by them. “The Canaanites, the Hittites, the Amorites, the Perizzites, the Hivites, and the Jebusites” (3:5) would be a vehicle for the testing of Israel as they intermarried (2:20–22; 3:5–6). Let’s now look in more detail at several of the judges. Because the children of Israel turned away from God, the king of Mesopotamia was allowed to defeat them and put them under tribute for eight years. Only then did they cry out for help, and God “raised up a deliverer . . . Othniel,” a nephew and son-in-law of Caleb, one of Israel’s faithful from the time of Moses (1:13; 3:9; Numbers 13). Othniel succeeded in freeing the people from Mesopotamian subjugation for 40 years. After his death, the Israelites drifted away from God once more. Now the deliverer Ehud, from the tribe of Benjamin, was sent to free them from the Moabites. He did this by surreptitiously killing their king, Eglon, in his private quarters (3:16–25). Supported by the tribe of Ephraim, Ehud then defeated the Moabites in battle, and the land was peaceful for the next 80 years (verses 27–30). Shamgar is briefly mentioned next as freeing Israel from the Philistines, 600 of whom he killed personally (verse 31). It may be that he was not an Israelite, his name possibly being Hurrian in origin. In his days Israelite caravan trade was disrupted for fear of Canaanite attacks, and the unwalled villages of the high country were under similar threat until the prophetess Deborah came on the scene (5:6–7). After Ehud’s death, the Israelites had fallen once more into idolatry, bringing on punishment in the form of Jabin of Hazor, a king of the Canaanites (4:1–3). At this point the prophetess Deborah was judge in Israel, located in the central territory of Ephraim. 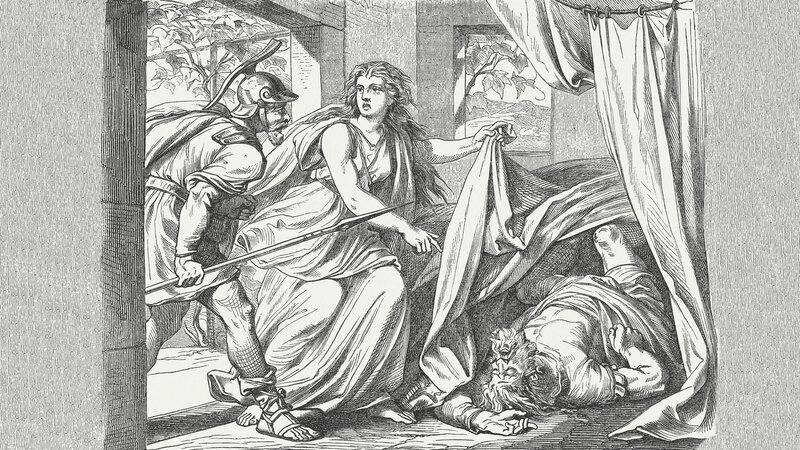 Because of Jabin’s oppression, she called on Barak, a leader of the tribe of Naphtali, to bring together 10,000 men to fight against Jabin’s forces and their 900 chariots under the command of Sisera (verses 4–7). Barak’s unwillingness to go up without Deborah may have revealed his initial lack of courageous leadership, and as a result, she said, he would gain no credit for the rout of the Canaanites; rather, a woman would bring about the enemy’s downfall (verses 8–9). With God’s help they defeated their oppressors (verses 14–16), and Deborah’s conviction was borne out; the Canaanite commander was killed not by Barak, nor his men, but as a result of treachery by Jael, the wife of one of Jabin’s allies (verses 17–22; 5:24–27). Nevertheless, mercifully, 40 years of peace ensued. Despite God’s obvious intervention against the king of Hazor, the Israelites soon forgot His mercy and His way. Now the Midianites came against them for seven years (6:1–2), destroying their crops and livestock: “So Israel was greatly impoverished because of the Midianites, and the children of Israel cried out to the Lord” (verse 6). Now God sent a strong man, but one whose faith first needed bolstering: Gideon. In his initial encounters with God, Gideon was skeptical that He would deliver. He expressed doubt that his Manassite clan was strong enough to make any difference to the imbalance with Midian and their allies—the Amalekites and “the people of the East” (verses 3, 33). Gideon would be convinced only if God gave him a sign. The sign was given in the form of God’s fiery consuming of an offering set out by Gideon. Commanded now to demolish his father’s pagan altar and its wooden image of the Canaanite god Baal, Gideon complied and offered a further sacrifice, but only by night for fear of reprisal by his fellow citizens (verses 25–27). Called into question by his neighbors, he was defended by his father and renamed Jerubbaal (“let Baal contend”), indicating his vigorous challenge to Israel’s pagan worship. Judges records that God’s Spirit came upon Gideon and as a result he blew the trumpet to gather four of the tribes together to fight the Midianites and their allies (verses 34–35). Yet again Gideon doubted, asking God for another sign that He would back his leadership. A fleece was laid on the ground overnight. If in the morning it would be wet and the ground around dry, “then I shall know that You will save Israel by my hand” (verse 37). Though God answered in the desired way, Gideon pressed for still an additional sign—a dry fleece and wet ground. Again God answered in the positive. Now it was time to assemble against the Midianites. But God had a test of faith in mind for the Israelites: their numbers would be whittled down from 32,000, so that it would be obvious that only God could give them the victory. First, all the fearful were asked to leave; 22,000 departed. Next, the troops were asked to drink water from a stream. Only those who lapped the water from their hands were selected; the rest who knelt to drink were sent away. Only 300 now remained (7:1–8). By listening in on a nighttime conversation between two men in the Midianite camp, Gideon learned that they were afraid as a result of a dream. Now he knew that he would be victorious. Dividing his troops into three groups, each man with a trumpet and a jug with a lighted torch inside, they surrounded the sleeping camp. At Gideon’s signal they blew the trumpets, broke the pitchers, raised the torches and shouted, “The sword of the Lord and of Gideon!” This induced panic among the 135,000 Midianites and their allies; they turned on each other in their confusion, and the remnant fled. Now the tribes chased them out of the land, Gideon calling latterly on Ephraim to join the pursuit. The Midianites were defeated and their princes killed (verses 9–25). But the Ephraimites felt snubbed by being asked only at the end of the battle to join forces against the Midianite alliance; Gideon skillfully argued for their importance in Israel, and their upset was abated (8:1–3). What happened next in Gideon’s story does him no credit. Because his men were weary in chasing down their enemies, specifically the kings of Midian, they stopped for rest and food across the Jordan in the towns of Succoth and Penuel, belonging to the Israelite tribe of Gad. But rejection by his fellow Israelites caused Gideon to return after his capture of the Midianite kings and wreak brutal personal vengeance on the Gadites, killing many of them (verses 13–17). In this he treated them no differently than he had his non-Israelite enemies. Nevertheless, the victory that Gideon had achieved under God’s guidance caused the people of Israel to request that he should be their king. Gideon’s refusal on behalf of himself and his descendants hinged on his understanding that Yahweh alone was their king. But strangely he then set up an idol of some kind, fashioned from the booty surrendered by the Midianite kings, and the Israelites began to worship it. Despite this, 40 years of peace ensued under Gideon (verses 22–28). This allowed him to return to his home in Ophrah to his many wives and 70 sons (verses 29–30). After Gideon’s death, the Israelites sank into idolatry again; they “played the harlot with the Baals, and made Baal-Berith their god” (verse 33). One of Gideon’s sons by a servant woman from Canaanite Shechem was named Abimelech. This ambitious young man set himself up against his brothers, murdering all except the youngest, Jotham, who escaped. Abimelech achieved this by allying with his other family and supporters in Shechem and by hiring men to accompany him to Ophrah to commit the mass slaughter. Having funded the hiring of these men with silver from their local temple to Baal-Berith, the men of Shechem now made Abimelech their king. Here, then, is another terrible episode in Israel’s history. Warned by Jotham that their subterfuge against the house of Gideon, a man who “fought for you, risked his life, and delivered you out of the hand of Midian,” would only lead to disaster, Abimelech and his supporters continued a mere three years before “God sent a spirit of ill will” between them (9:1, 17, 22–23). Internal divisions led to Abimelech’s defeat of a rival supported by the men of Shechem; to Shechem’s destruction and the burning alive of a thousand men and women; and to the death of Abimelech when he was so grievously injured by a falling millstone at the hands of a woman that he asked his armorbearer to kill him (verses 39–55). The author of Judges is left to conclude, “Thus God repaid the wickedness of Abimelech, which he had done to his father by killing his 70 brothers. And all the evil of the men of Shechem God returned on their own heads, and on them came the curse of Jotham the son of Jerubbaal” (verses 56–57). Continuing the theme of deliverers and departure from God followed by further merciful intervention, we read about several more leaders. Next comes Tola from the tribe of Issachar (10:1), in territory adjacent to the location of Abimelech’s failed rule. Tola’s 23-year tenure is described with very little more detail. His successor was Jair from Gilead, part of the territory of Manasseh, Gad and Reuben east of the Jordan. His name may indicate a Manassite connection (see Numbers 32:41). After raising 30 sons, possessing 30 towns, and governing for 22 years, he died (verses 3–5). Under both judges the Israelites seem to have enjoyed peace. This is a contrast to the days of Shamgar and Jael (5:6–9) in the same general region, and to the coming brief leadership of Jephthah in Gilead. There are a number of parallels between the accounts of Jephthah and Gideon. Both narratives open with confrontation between God and Israel; both men have insignificant backgrounds but become tyrannical; both receive help from God’s Spirit yet become skeptical about God; they win great victories, deal with contentious Ephraimites and brutally attack their fellow Israelites. In other ways Jephthah was very like the erring Abimelech. Yet Jephthah was ultimately not a failure in everything but a deliverer. He came on the scene at the low point of Israel’s apostasy: “Then the children of Israel again did evil in the sight of the Lord, and served the Baals and the Ashtoreths, the gods of Syria, the gods of Sidon, the gods of Moab, the gods of the people of Ammon, and the gods of the Philistines; and they forsook the Lord and did not serve Him” (10:6). This is a list of the gods of the seven nations that Israel was to disinherit (Deuteronomy 7:1), but they succumbed instead. As a result, the Philistines and the Ammonites shattered and crushed them. The oppression lasted 18 years (Judges 10:7–8). Now they were ready to cry out to God once again and have Him save them. They were ready for God’s deliverer. Jephthah’s background disadvantaged him from the start; he was the son of Gilead and a prostitute, an outcast, his companions “worthless men” (11:1–3). The elders of Gilead sought him out as a commander to fight against the Ammonites. He agreed on condition that if he won, they would make him their leader. The Ammonites claimed that Israel had taken their lands (specifically Moab, which was not Israel’s by inheritance), and they demanded restoration. Jephthah explained that this territory was already in the hands of an Amorite king when God gave the Israelites the victory (verses 12–22). The Ammonites rejected Jephthah’s argument and went to war. As he arrived to fight against them, Jephthah made what turned out to be a rash vow. He promised that if God would grant him victory, then on his arrival home he would dedicate whatever came out of his house to God, intending an animal sacrifice (verses 29–31). Sadly it was his only child, a daughter. His promise could not be undone; he had no other possibility of passing on his inheritance than to her, and now she would have to be dedicated to God (and remain unmarried and therefore childless). The remaining material in the account of Jephthah’s term is the war against the restive and proud Ephraimites. That hostility brought about the death of 42,000 of his fellow Israelites (12:1–6). Jephthah was buried in his home territory of Gilead after a six-year rule. The seven-year judgeship of Ibzan followed. He was most likely from Bethlehem of Zebulun (see Joshua 19:15) rather than Judah, since the latter is always specified as such in the Scriptures. He had 30 sons and 30 daughters, indicating polygamy. Two judges succeeded him, Elon from Zebulun and Abdon from Ephraim, who also had many children and seem to have lived in a time of prosperity. They ruled for ten and eight years respectively (verses 8–15). Next time we’ll continue this checkered period of Israel’s history with perhaps the best-known character study in the book of Judges—Samson. Daniel I. Block, The New American Commentary, Volume 6: Judges, Ruth (1999). Trent C. Butler, Word Biblical Commentary, Volume 8: Judges (2009). Alan R. Millard, “The Value and Limitations of the Bible and Archaeology,” in Israel: Ancient Kingdom or Late Invention? edited by Daniel I. Block (2008).